There are a number of similarities, specially in the capability of quickly running C# scripts. Most of the differences come from the fact that they have are different approaches and development histories. LinqPAD (I think) was developed to help improving the execution and visualization of LINQ Queries, where the O2 Platform (and its REPL environment) was created to help to script application security analysis, and eventually O2 evolved into a full scripting and application development environment. 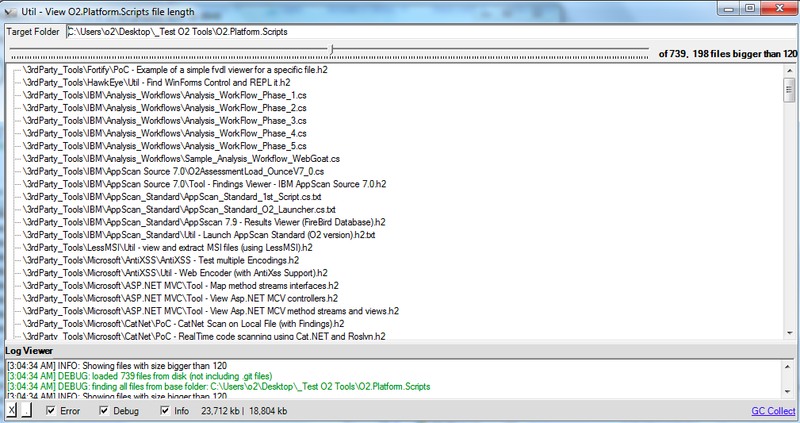 Most of O2.Platform's functionality is made of scripts, which are stored in the O2.Platform.Scripts folder which is available in this Git repository . See also O2 Platform Blog for a large number of script examples. The REPL environment can also be used to expose (or debug) objects on applications being developed. There is an 'Script_Me(...)' extension method that open up a new WinForms window with the 1st parameter (the 'this' value) being 'feed' to the REPL environment. Included in the O2's REPL environment is an Fluent API, which Is called Fluent# and is available at CodePlexor NUGet (note that these are a bit out of date with the current distribution of O2). This API really makes the O2's REPL environment powerful since you can execute quite complex tasks with only a few lines of code (its still C# , but there is extended use of C# Extension Methods to reduce the amount of code needed). You will see the Fluent# APIs in action, on most (if not all) O2 scripts. 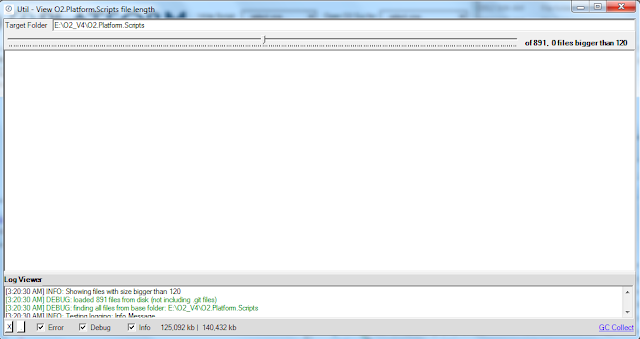 I would like to stress that that I don't view O2 as a competitor / replacement for LinqPAD! 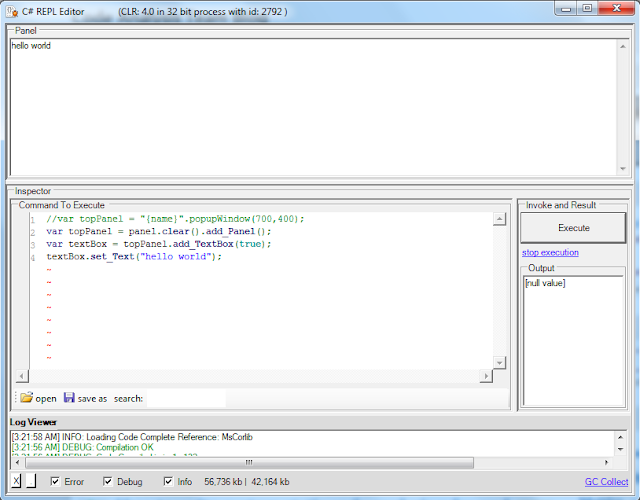 If anything I want to make LinqPAD better and be able to integrate it's capabilities with other tools. My objective with O2 is not to invent all wheels, but to use the best possible technology to solve the problem at hand. Over the past months I have been using Rolsyn in a number of scenarios, creating in the process multiple O2 Platform tools which might be useful to new Roslyn users. Here are the stand alone exes, all about 9Mb since they contain the Roslyn dlls and the O2 REPL Script environment as embedded resources. The titles of these tools should give a good clue on what they do, but if you want me to expand on them (or how the script works), just add a comment to this post with your request/questions. 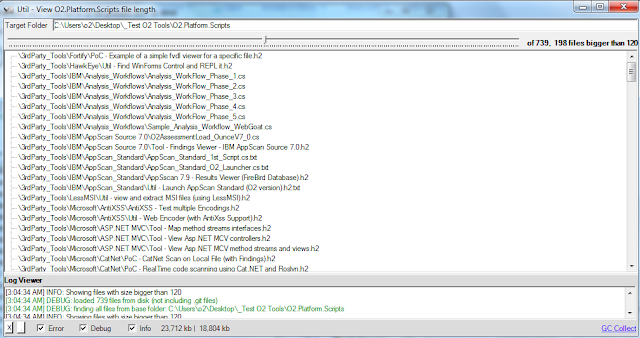 Note that you can run all these scripts using the latest version of the O2 Platform (just search for 'Roslyn' scripts). 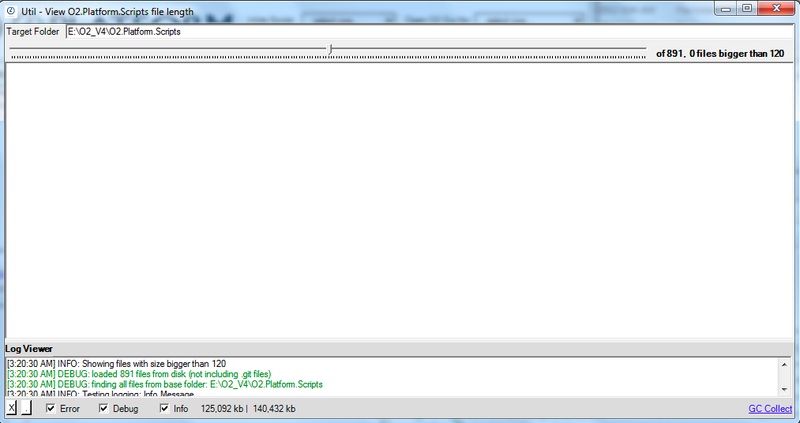 Amazingly in 2012 windows still complains for paths bigger than 240 chars. Now that O2 can be easily installed from a single exe, there is a normal case where O2 will be started from path that is a big long (lets say more than 100 chars). This created a problem since the O2 temp dir would be created from that path , and there were a number of scripts that (since I like to use verbose file names) would break the 240 char limit (which would make the unzip of the O2.Platform.Scripts folder to fail). So to help me solve this, I wrote a quick tool that gives me a quick view of what files are bigger than a particular size. As you can see there were 198 files whose path was bigger than 120. I just published a stand-alone version of the main O2 Platform GUI and its C# REPL environment, and if would be great if you took them for a test-drive before a wider release (namely the rest of the OWASP community). Just found http://repl.it/ and it looks really good. Yeah it's Marketing but its actually quite a nice description of SI (Security Innovation) focus on Application Security. How to control the position of a new ToolWindowPane when created programatically. If you noticed from the ProvideToolWindow attribute above, I use it to define the place where new instances of this window are created. My issue in that at the moment I don't seem to be able to set them programatically (specially the target Window GUID). Is the [ProvideAutoLoad(UIContextGuids80.NoSolution)] the best way to get some code to run on VisualStudio load?